Outgoing federal Senator Nick Xenophon was a master at the political photo opp. South Australian Senator Nick Xenophon announced this morning that he will quit federal Parliament in order to run for the lower house seat of Hartley in the next South Australian election. While my colleague Bernard Keane looks at Xenophon's policy legacy and what comes next for the Senate crossbench, it's also a chance to look back at Xenophon's other legacy: the perfect photo opp stunt. Perhaps his last big federal photo stunt (apart from today, of course) Xenophon held a press conference to announce that he was a dual citizen -- not of Greece but of the UK. He marked the occasion by drinking a pint of Guinness. Campaign advertising at its best. Truckies and unions were summarily dealt with, so what the hell do MPs do now? What if the crossbenchers call Turnbull’s ABCC bill bluff? 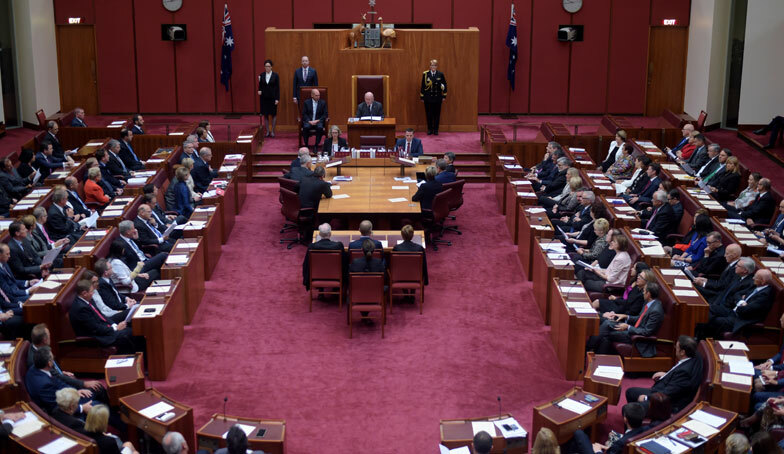 Will the crossbench senators vote for the ABCC bill to save themselves from a double dissolution election? A double dissolution would put the legislative ball squarely in the progressives' court, writes Greens Senator Lee Rhiannon.